It is always great to hear testimonies about what God is doing, and we already have several great stories to celebrate from our HEROES Series this fall. I used the Serpent/Dove method with my daughter this morning. It was incredible! Because my opinions, thoughts & feelings weren’t the focus I was able to really listen & ask key questions based on what she was telling me. I even used Jake’s phrase…..”so, lets get away from talking about the individual & their problems & get back to whats going on inside of you.” Instead of me advising & fixing & telling her what she should or shouldn’t do, she answered her own questions and gained insight for herself as to why she was struggling so much over a difficult decision she needs to make concerning this same individual and that she can go to God’s Word for wisdom. All glory goes to God when we honor others by listening and put the focus on Jesus instead of ourselves. We had __ adults last night and tears were flowing within the first 5 minutes of the conversation. All but three people opened their hearts and shared last night in powerful ways! The Holy Spirit was absolutely moving from beginning to end. To God be all the glory! [One member] said the group went deeper in one night last night than their group ever went in an entire year last year. Last night went great! God definitely provided someone to mentor. The storytelling went well and was easier than I had expected. We dialogued a little during the story, and then rebuilt it. As we started ‘going deeper’ a couple people started talking about hearing God’s voice and as I thought it was an opportunity to explore I found out that they didn’t feel that God was speaking to them or that they were hearing God’s voice. I decided to use the rest of our time on hearing God’s word. I know the Spirit was leading cause of a story one of the girls shared that coincided with what we decided to discuss. One thing I noticed/love about the biblical storytelling method is that no energy is spent on things like, “I didn’t like what the author said about…; I didn’t agree with this…; etc.” It’s just Scripture going right into our hearts. Hi Reg, tonight was our first opportunity to get into the text of our study. [My spouse] and I went in thinking “man, our group is NEVER going to open up.” It has been difficult getting to know each other at a deeper level. But as you’ve heard so many times by now, the walls came down and the tears were flowing. There wasn’t a dry eye in the house tonight, praise The Lord!! It was so amazing and we have been so blessed by the things that took place and the things that were shared tonight. Just thought I’d let you know. So thankful that the Holy Spirit works despite our own doubts and shortcomings. Our dear friends who have experienced the most tragic event a parent can, and to be going though another heart wrenching thing are CHOOSING to stay faithful because they know that God has not left them and that He is with them even when things go so wrong. MY faith is strengthened tonight because I now know that our friends have found that faith in God. Thank you for being in this small group with us. 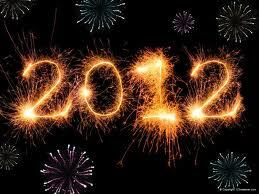 May we continue to grow, learn and strengthen each other over the next few months. Hi, Reg. I want to thank you for the study provided for small groups this year. It really sparks good discussion, but better yet, I like it because it is not a “deep” study, one where I felt I have to be a Bible genius, but rather am able to be relational with those in our group. I personally feel that small groups should be about relationships as much as a Bible study. About sharing and praying, rather than an exegetic study. Small group, to me, is about family, and I surely do feel part of a family at our gatherings. Good job and I hope the future will bring more studies like this. Thank you to all who were responsible for the writing and publishing of this study. Praise for the Heroes Study. It has sparked a renewed vitality in our small group. Maybe your group has not experienced flowing tears or great redemption stories, yet. That’s okay. Group life, like all life, goes through seasons. Some are dry, but guess what, God moves us through the desert. Some are average, but guess what, God grows us through disciplined persistence and perseverance. Some are painful, but as we know, God often uses those times most effectively of all. And some are full harvest, which is where some of our groups are right now. As we share these great testimonies, we should all celebrate this time of God’s blessing and keep our eyes fixed on Him, through every season. If you are not in a small group right now, it is always a good time to join one. 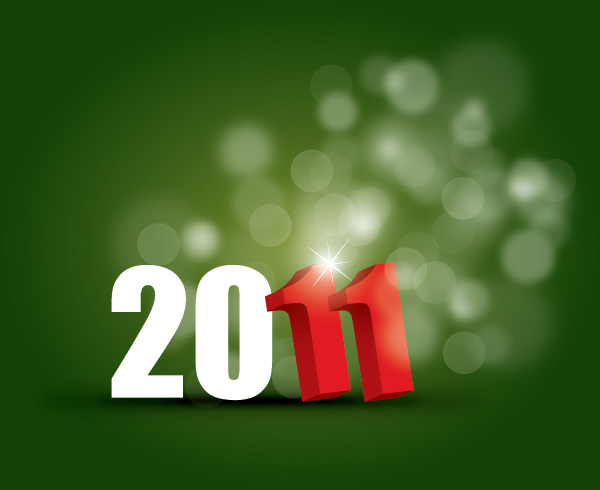 See a list of the groups and how to join, right here. 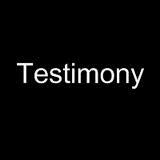 In addition to showing this video in all of this weekend’s services, we celebrated our experiences with testimony time. The testimonies were great. They were not recorded, unfortunately, but such a blessing for everyone who heard them. Does having such an annual service day mean this is the only weekend our church is out serving people? Of course not, and thank God that LCCC cannot credibly be accused or even perceived that way. But yet the remark is still made each year: “I wish we could do something like this all the time.” Well, the truth is, we can! 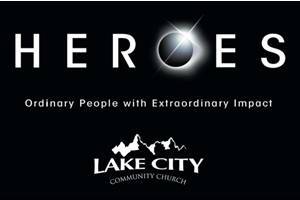 Lake City is loaded with ministries and missions who are doing this every week. Our 30-plus small groups can recreate this thrill any time they choose! We are training small group leaders to place an increasingly higher value of serving people and doing mission together, as a formative, obedient and blessed part of their Christian community. Another all-too-prevalent hindrance to a life of service is an all-too-busy life. I had the honor of preaching the “sermonette” in our testimony services last weekend. I focused on not merely serving, or leading, but servant-leading, as our Founder and Master Jesus Christ set the way for us to do. To stay within my allotted time, I had to cut out this great illustration, which hits very close to home for me (and likely the other ultra-busy Christians out there). Thankfully, I have the opportunity to include it here. The factor that made a large difference in helping behavior was the time pressure put on the subjects. Those seminarians who were placed under great pressure tended to help less than the seminarians who were given a more leisurely pace to compose and deliver their short talks. The seminarians under pressure seemed not to have processed the new situation (the “victim”) since they were so absorbed with fulfilling their first duty—preparing the talk and getting to the other building for their presentation on time. Indeed, several seminary students literally stepped over the victim as they hurried off to speak on the parable of the Good Samaritan! When I think about this study, it reminds me that I too can fail to meet ethical obligations on my way to do a good deed. Enjoy the videos, and take the poll! Small group testimonies posts always seem to be favorites – and helpful too, to hear what’s going on out there. Some great reports are being shared early this fall, after just the first couple meetings. This brand new group is off to an impressive start. In their “small group covenant” conversation they decided to expand their meetings to allow time for eating a meal together every week. A few of our groups do the same. And while a weekly meal might not work for every group, there is no question that Jesus intended breaking bread together to be an inherent activity of His church. These leaders are also committed to building relationships with their members throughout the fall by having each of them over for dinner; taking each of the men out to breakfast; serving together in mission, and every other way they can. Great job, group. Those are the beginnings good shepherding! 3. In a similar way, a different group leader emphasized how they will be shepherding each person/family in their group by having them over for dinner to discuss a specific path for their spiritual growth this year. 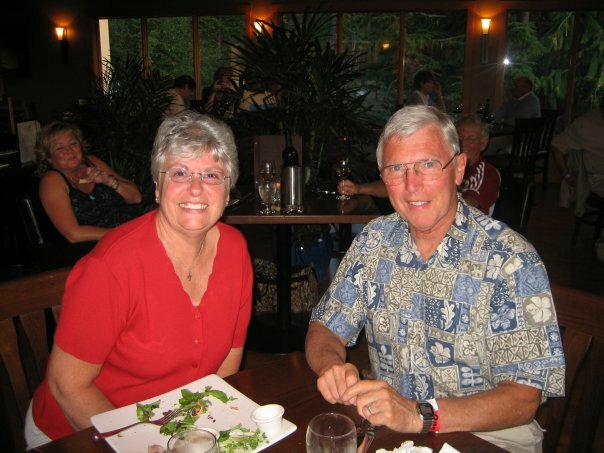 For example, he plans on encouraging at least one family in his group to consider doing a short-term trip to Niger. This is a wonderful plan that should be considered by every leader! 4. Mark and Kelsey Wilkening have returned as small group leaders after getting The Father’s Heart ministry off the ground this last year. One striking thing the Wilkenings and their co-leaders, Jeremy and Hope Evarts, are experiencing with this brand new group is being a certain sort of microcosm of the larger church family. Many new faces fill our church since adding the Saturday night service last fall, and the Wilkening/Evarts group is filled with several of these new faces. Great job, small group leaders. Our Good Shepherd is pleased when we take our calling to care for His flock so seriously. 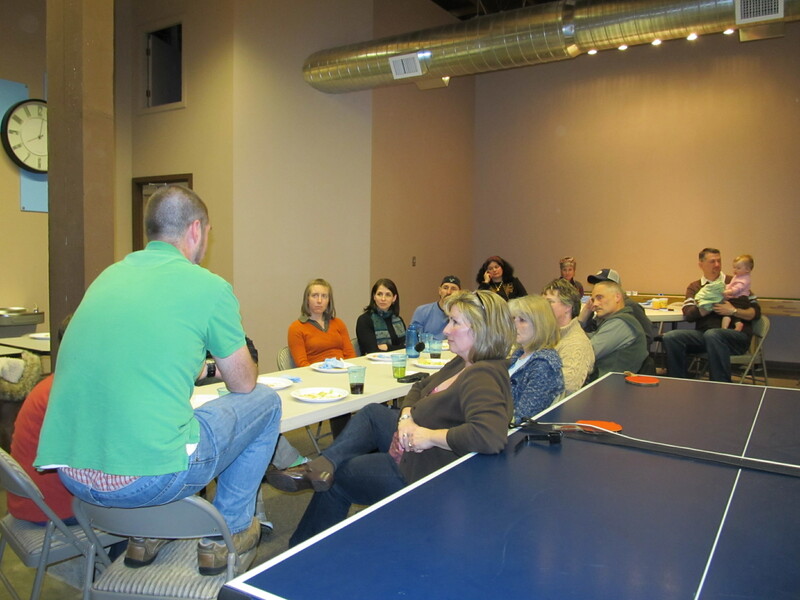 MORE Great Testimonies from Lake City Small Groups! Does communion belong in a list of creative ways to worship as a small group? OR, is it an intrinsic and central part to life as the “church scattered?” I am more convinced that the latter is truer to the New Testament’s guidelines. 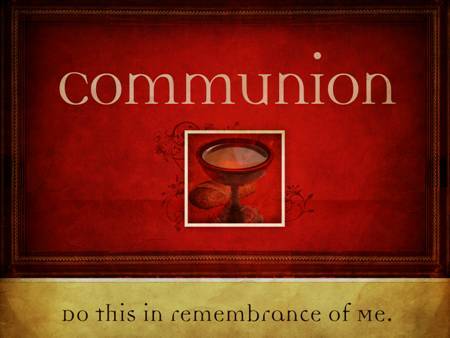 “I conducted Communion with our Small Group on 4 Mar 11. This was a new experience. All the members were excited. The plan was each individual would first share their testimony. I started by giving my testimony and a couple of times I rededicated my life when my children were dedicated. This set the tone, and I went around to each member who then gave their testimonies. “I then read from I Corinthians 11, explained the purpose of communion and the symbolic meaning. I then passed the elements to each person; then we prayed and partook of the elements. Yes, sharing salvation stories within your group is an important activity which not only brings everyone closer together (Rom. 14:19), it also glorifies God (Ps. 118:21), reveals if each member is actually a believer (2 Cor 13:5), and ensures that all are able to share their faith (2 Pet. 3:15). Great job, Olson group, and others who have already done this! Hosting a large dinner for the kids, similar to last year, where we brought dinner for around 30-40 kids, served, ate and cleaned up with the kids. Running a cooking class with kids at the center this summer. 1) Crazy Love – After the Hewitt group’s amazing experience with this Francis Chan study last year, the Oury and Johnson groups jumped into it this year, with similarly encouraging results. 2) Radical – Haven’t heard of David Platt’s book yet? You will. The Higbee group is pioneering this still unrefined small group study of one of the most challenging books of our time. 3) Vintage Jesus – The R. Williams group has been enjoying studying and discussing Mark Driscoll’s deep and different perspective on the Man who is God. 4) 10 Dumb Things that Smart Christians Believe – Three groups are working through this challenging little book, with some pretty interesting results. New draft of Small Group Adopted Missionaries is coming soon! LCCC’s Second Annual Faith In Action (FIA), July 30/31 – Small Groups, Prepare! GREAT IDEA: Someone to start a Saturday Night Group at 7:30pm, during the youth group’s new meeting time. Anyone interested? Just contact me at reg.overstreet@lc3.com. End of semester party for anyone involved in leading small groups. Watch for more info about that, soon!